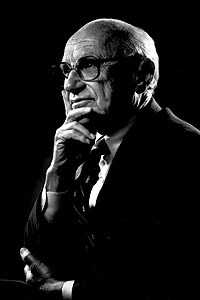 The University has announced it will establish a center for path-breaking research to build upon the strengths of economists throughout the University and to honor the contributions of Milton Friedman, considered by many to be the leading economist of the 20th century. The University’s investment in the new institute will be about $200 million, with half of that amount establishing an operating endowment and the remainder allocated for facilities and other start-up costs. The majority of the funds will be raised in donations from alumni and business leaders around the world. “The goal of the institute is to build on the University’s existing leadership position and make the Milton Friedman Institute a primary intellectual destination for economics by creating a robust forum for engagement of our faculty and students with scholars and policy-makers from around the world,” said President Zimmer. “The Milton Friedman Institute will continue Chicago’s extraordinary tradition of creating new ideas that stimulate the academic world and innovative approaches that influence policy. “The institute will begin ramping up in fall 2008, with University resources supporting an initial visitors’ program. In addition, we will immediately launch the search for a director,” Zimmer said. International scholars will join Chicago faculty in the Department of Economics in conducting research on topics related to economics, business and law. Faculty from the Graduate School of Business and the Law School also will play an active role in the Friedman Institute, which a director and faculty advisory group will lead. 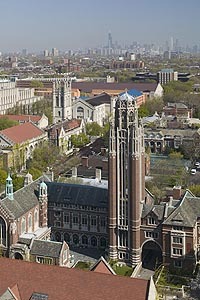 The Milton Friedman Institute will occupy buildings that currently house the Chicago Theological Seminary, which the University is purchasing to enable the institute to be centrally located between the University’s Main Quadrangles and the Charles M. Harper Center of the Graduate School of Business. The seminary’s main building (5757 S. University Ave.) will be renovated to respect its architectural and historical significance, as well as to create a home appropriate for the institute and possibly the Department of Economics. As part of the purchase agreement, the University will construct a new home for the seminary. Though there are no immediate plans to relocate the Seminary Co-op Bookstore, its owners have expressed an interest in exploring new options. The Friedman Institute will build on a tradition of strong research in economics, an approach to scholarship that has become known as the Chicago School of Economics. That tradition has created a research environment that has led to Nobel prizes in economics for 25 faculty, researchers and alumni. “The institute will build on this important tradition by focusing on research questions that support development of economic models grounded in economic theory and empirical evidence and designed to evaluate a variety of questions related to economic policy,” said Nobel laureate Gary Becker, a member of the faculty committee that developed a recommendation for the institute. Becker is the University Professor in Economics and the Graduate School of Business. A goal of the institute is that visiting faculty will play an important role in developing new ideas, Hansen said. The institute also plans to develop a program for outstanding young scholars, who will become post-doctoral fellows. The institute “will help us break down intellectual barriers by giving experts the support required to run workshops during extended visits and to recruit complementary younger visitors. Thematic workshops over extended periods of time will allow us and our colleagues to explore potential synergies through repeated dialogue and exposure to promising lines of research,” he said. An initial set of donors at the $1 million and $2 million level will be invited to become members of the Milton Friedman Society. Members of the Society will take part in the Institute’s activities, which will include workshops, seminars and lectures that will focus on fundamental questions in economics, business and law as well as related disciplines such as medicine and public policy. Friedman, who died in 2006 (http://chronicle.uchicago.edu/061207/miltonobit.shtml), was a longtime University faculty member who was known for his intellectual fearlessness. His work was frequently criticized, particularly during the early part of his career, but he persisted and was able to convince other economists and policy-makers of the merits of his position.